Voting on the proposed agreement will occur online between Friday 12 April and Monday 29 April. You will need your team member number and your date of birth to vote. To vote via phone, call 1300 830 563. If you have any questions, please get in touch with your local SDA Branch. Following extensive negotiations between Bunnings and the SDA the proposed Bunnings Warehouse & Smaller Format Stores Agreement is ready for you to consider. The following is a summary of the proposed Agreement and changes from the Bunnings Warehouse / Small Format Stores Agreement 2013 (“the 2013 Agreement”) and/or provisions different to the General Retail Industry Award (“the Award”). A full copy of the proposed Agreement is available in your store, or can be accessed here. Removal of the Bank of Hours system and replaces it with a more standard system of rosters and working hours more closely aligned with the Award. This includes consultation with you before any changes to your regular roster. and any agreed additional hours are worked over a 4 week roster period. A full time team member cannot have their hours reduced below 152 hours over a four-week period but on a voluntary basis they can choose to work additional hours. Casual team members were not previously subject to the Bank of Hours and your arrangements only change slightly under the proposed Agreement. Wages will continue to be paid fortnightly, based on your contracted hours (plus any additional hours, penalty rates or overtime). If the proposed Agreement is accepted and approved, current team members will move to the new system based on your current weekly average hours. This is better than the 2013 Agreement that only entitles team members to two consecutive days off per fortnight. Rosters will be issued electronically for a 4-week period at least 2 weeks in advance. access to safe transport home. These provisions do not exist in the Award. When changing a team member’s regular roster – including the roster of a casual team member who has been working a regular pattern of hours – Bunnings has to consult with you and provide information about the proposed change, and then give consideration to your issues (if any). While this provision does not prevent the Company from making roster changes, it does ensure team members can voice their concerns and have them considered. 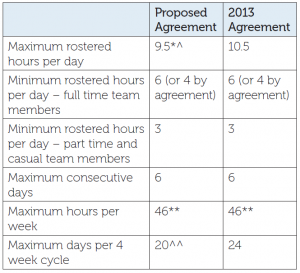 Under the proposed Agreement, and consistent with the Award, part-time team members will be contracted for a set number of hours per four week cycle. A part-time team member may agree to work additional hours offered by the Company. A part-time team member can provide standing consent to work such additional hours at the relevant ordinary time rate (plus any penalty rates). The standing consent does not oblige the team member to accept any particular additional hours offered, each time they can be accepted or rejected. For the year ahead, you choose how you will be paid for your additional hours (if you choose to work them). You choose to either be paid each pay cycle for the additional hours, or to take the additional hours as time off in lieu (“TOIL”) . 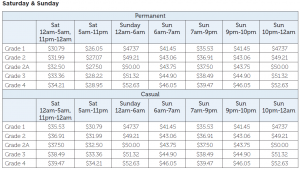 Once you choose how you want to be paid for additional hours you cannot change your choice until the following year. TOIL is taken at the penalty rate equivalent. For example, if the team member works 4 additional hours on a Sunday, they accrue 4 hours x 150% equals 6 hours of TOIL. Alternatively, if the team member has 6 hours of TOIL accrued and takes such TOIL off on a Sunday, they would be able to take off 4 hours. Under the proposed Agreement, overtime is payable for work outside of the roster rules including maximum hours, days and consecutive days of work, as well as in circumstances where the team member does not receive a 10 hour break between shifts. Overtime is paid as 150% first 3 hours, 200% thereafter. You cannot be rostered to work outside the span of hours, but you can agree to do so. If you agree, then the work is not overtime but is instead ordinary hours with penalty rates and you also accrue leave and superannuation on the hours. 1. Box packer and trolley collector move from Grade 1 to Grade 2. Forklift Operator — a Team Member who holds a valid forklift licence and is regularly required to operate a forklift. Trade Desk Team Member — a Team Member who is regularly required to, and works the majority of their shifts on, the trade desk. Expert Team Member — a Team Member who completes the required training, and who is appointed to the position of an Expert Team Member. Team members who move into a higher grade as a result of these changes will be paid at least the minimum rate for the new grade. Team members who are already paid at a rate above the minimum rate for their new grade would not necessarily receive an increase based on the grade movement, but would still be subject to the performance pay system. 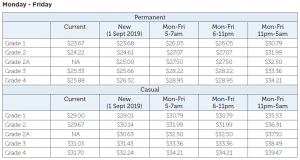 Effective from 1 September 2020, team members directed by the Company to perform higher graded duties for more than half of their rostered hours in a week will be paid at the rate of that higher grade for the entire week. If a team member receives such a payment for a period of 8 consecutive weeks, they may request that the Company appoint them to the higher grade. The Company will grant such requests where it is consistent with its operational needs. CPI is the inflation rate. CPI is the June figure for the national Consumer Price Index published by the Australian Bureau of Statistics. The SDA wanted to ensure that your real wages were protected, and so our position was that the average increase should be 2% or CPI whichever is the higher. The Company rejected this and have put a position of 2% or if CPI is higher then an increase of up to 2.5%. As a result, the parties could not reach agreement on this issue. Previous Bunnings Agreements have used what is known as a “loaded rates” system, whereby higher base rates offset certain penalties being lower. In each case, the previous Agreements have been approved by the Fair Work Commission. 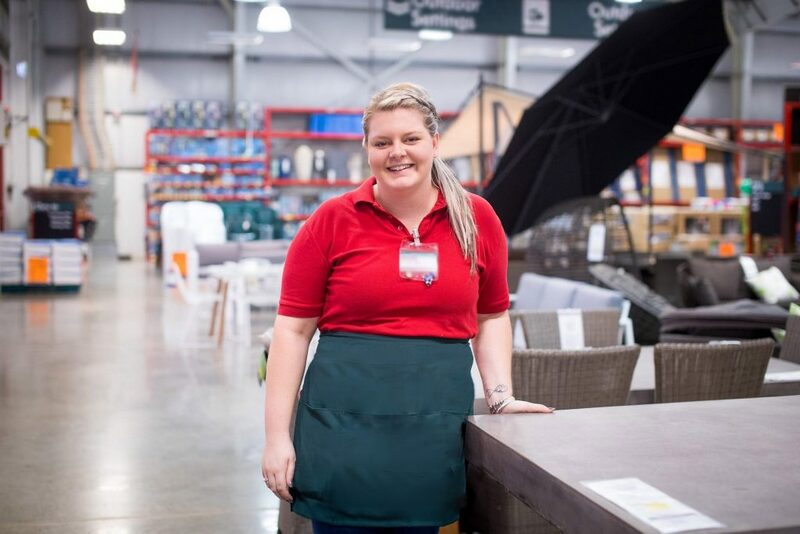 Although other retailers have moved away from this model (to a model with lower base rates and higher penalties), Bunnings continued to advocate a loaded rates model. The SDA was very mindful of the high base rates at Bunnings and resolved to work with the Company to retain these rates, while ensuring the proposed Agreement will pass the Better Off Overall Test (“the BOOT”). The new Agreement needs to ensure there is no possibility of any team member receiving less wages than you would receive under the Award. In the vast majority of cases at Bunnings, this is not a problem, as the lowest Bunnings base rate currently paid under the 2013 Agreement is around $110 a week higher than the Award. this view to the Fair Work Commission but leave the decision in their hands: if they are prepared to accept 12 weeks then we will accept and respect that decision. The Company may refuse the team member’s request, but only on reasonable grounds (examples of which are set out in the proposed Agreement) and only after consultation with the team member. Where a request is refused, the Company must provide written reasons to the team member, who then has the option to pursue the matter as a dispute as per the proposed Agreement’s dispute resolution procedure. 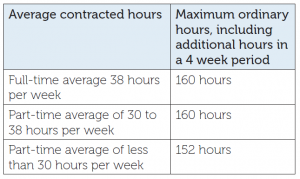 The proposed Agreement contains a provision, effective from September 2020, which allows part time team members who have regularly worked more than their contracted hours (by accepting additional hours as explained above) to request that their contracted hours be increased to reflect the actual average hours worked over the previous 12 months. While the provision does not provide an automatic right to be granted these hours, the Company is obligated to do so where it is operationally viable. The proposed Agreement provides all team members (including casuals) with the right to take up to five days of unpaid leave to deal with situations involving family or domestic violence. The proposed Agreement contains a new provision that allows a team member to volunteer to complete relevant online training away from the workplace. Such training will be paid as per the time allocated for the relevant module(s) in the learning catalogue. In addition, the proposed Agreement, while still allowing the one-hour training shift as per the 2013 Agreement, makes such a shift voluntary. With the demise of the Bank of Hours, it has been agreed to change the treatment of non-worked public holidays to a system similar to that applying in the Award, and also to adopt the Award public holiday penalty structure. 1. The day is a day of the week that the team member regularly works. In this case, the team member is paid for the number of ordinary hours usually worked. 2. The day is a day of the week that the team member never works, or only works half (or less) of the time. In this case, the team member is not paid for the day. The proposed Agreement retains all of the public holidays from the 2013 Agreement, meaning Bunnings team members in certain states receive the benefit of more public holidays than they would under the Award. The requirement to work up to five public holidays in a year has also been retained. »» The proposed Agreement contains a shift-work provision (clause 4.2), broadly consistent with the provision in the Award. At this time, the Company does not have any team members who fit the definition of shift workers and has stated that it has no immediate plans to introduce shift work. (v) are experiencing family or domestic violence or caring/supporting a family or household member who is experiencing family or domestic violence. Voting will occur online, conducted by an independent third party. You will be notified when voting dates have been confirmed. If there is a majority yes vote, the proposed Agreement will go to the Fair Work Commission for approval. If you have any questions about the proposal, please speak to your SDA Delegate or Organiser, or call the SDA. No new Agreement will be introduced without a vote of Bunnings workers. The SDA has fought hard to deliver the best possible outcome for Bunnings workers. The SDA believes that, notwithstanding the issues which were not agreed, (being a 2.5% cap on the CPI increase and the 12 week period for reconciliation) overall the proposed Agreement delivers a positive outcome for Bunnings team members. The SDA and Bunnings continue to meet as part of negotiations for a new Bunnings Agreement. In negotiations so far, we have made significant progress on a new rostering system without the Bank of Hours. This new system will introduce the choice for employees to be paid for any extra hours worked or to accumulate time off if you choose. We continue to press that roster predictability, access to additional hours and better work life balance for SDA members must be addressed. We have also reached in principle agreement on a new superannuation provision that retains REST as the default super fund but provides choice for team members wishing to choose an alternative fund. Remember, you will have the final say. No new Bunnings Agreement will be introduced without a vote and a majority yes vote. The SDA will continue to keep you up to date with any progress. Last week the SDA met with the Company to continue negotiations for a new Bunnings Agreement. We have pressed that roster predictability, access to additional hours and better work life balance for SDA members must be addressed. We will meet again in the new year to progress negotiations. Bunnings and the SDA met yesterday as part of negotiations for a new Bunnings Warehouse and Small Format Stores Agreement. Significant non-compliance by Bunnings Managers in the operation of the bank of hours. A majority of SDA Members believe that the system overwhelming favours the company. A majority of SDA Members would like to be paid for additional hours worked and not have the hours banked. Yesterday, the SDA made it clear to the company that that Bank of Hours system was not working in favour of the majority of Bunnings workers and the system needs to change or it needs to go. Over previous rounds of bargaining the SDA has continually improved the Bank of Hours system and called for its removal. At yesterday’s meeting, Bunnings and the SDA, discussed what a new rostering model to replace the Bank of Hours would look like. Significant work is now being undertaken to re-write the Bunnings Agreement – without the Bank of Hours. The SDA and Bunnings will meet again next month to progress negotiations. We will be focusing on roster predictably, access to additional hours and better work life balance for SDA members at Bunnings. We will continue to keep all SDA members at Bunnings updated.